"In the bleak northern crown of the world, war is coming"
Maniye's father is the Wolf clan's chieftain, but she's an outcast. Her mother was queen of the Tiger and these tribes have been enemies for generations. Maniye also hides a deadly secret. All can shift into their clan's animal form, but Maniye can take on tiger and wolf shapes. 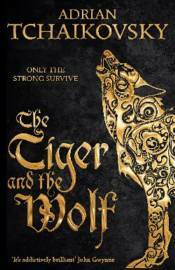 She refuses to disown half her soul so escapes, rescuing a prisoner of the Wolf clan in the process. The killer Broken Axe is set on their trail, to drag them back for retribution. The Wolf chieftan plots to rule the north and controlling his daughter is crucial to his schemes. However, other tribes also prepare for strife. Strangers from the far south appear too, seeking allies in their own conflict. It's a season for omens as priests foresee danger and a darkness falling across the land. Some say a great war is coming, overshadowing even Wolf ambitions. A time of testing and broken laws is near, but what spark will set the world ablaze?